Very Short Answer Type Questions. 1. How does a climber plant differ from a creeper plant? ground are called creepers. A plant having a weak stem that takes the support of a wall or other plants to climb is called climbers. 2. What is the difference between a shrub and a tree? Ans: 2. Trees are big and tall plants with hard and thick woody stem. Shrubs are medium-sized plants with a hard woody stem, which can grow up to 7 to 10 feet. 3. Name the two types of leaves. Ans:3. Simple leaf and a compound leaf. 4. Name the process by which plants make food. 5. Name the different parts of a plant. Ans: Root, stem, branches, leaves, flowers and fruits. 6. Write the names of the parts of a flower? 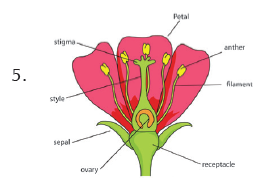 Ans: The main parts of a flower are: petals, sepals, stamen and pistil. 7. Name three agents which carry out pollination in flowers. 8. What is the male reproductive part of a flower called? 9. Name one plant which climbs with the help of leaf tendrils. E. Short Answer Type Questions. 1. Draw a well-labelled diagram of a simple leaf. Write the function of leaves. Ans: (a) Photosynthesis: In the presence of sunlight and chlorophyll green leaves with the help of water, minerals and carbon dioxide prepare their food. This plant food is a kind of sugar called glucose. During food making, the leaves give off oxygen. This process of making food by green plants is called photosynthesis. (b) Transpiration: The pores (stomata) present on the surface of the leaf allow excess water from the plant to escape in the form of water vapour. Roots absorb water which the plants use to survive and to make chlorophyll for photosynthesis. Usually, the water that is absorbed is more than what the plant can use. This excess water escapes through the leaves. This loss of water in the form of water vapour through stomata is called transpiration. 2. Differentiate between parallel and reticulate venation. (i) Reticulate Venation: Plants like a rose, Hibiscus and mango have a network of branched veins. The main vein has many branches to form a network of smaller veins. This venation is called reticulate venation. (ii) Parallel venation: In plants like palms and maize, the veins run parallel to each other. This is called parallel venation. 3. What are the advantages of transpiration in plants? Ans: Transpiration helps the plant in two ways. Firstly, it helps to cool the leaves. Transpiration also ensures a continuous flow of water from roots. As water escapes from the leaves, and roots they pull more water from the soil. This water brings with it nutrients required by the plants from the soil. 4. Distinguish between simple and compound leaves. (i) Simple leaf: In a simple leaf, the lamina is not divided into segments, i.e., the lamina is entire or whole. A simple leaf has an auxiliary bud in its axil. The leaves of hibiscus, mango, sunflower, dahlia, etc., are examples of a simple leaf. (ii) Compound leaf: In a compound leaf, the lamina is divided into segments called leaflets. The leaves of Gulmohar, tamarind, neem, rose, etc., are some examples of compound leaves. 5. Draw a colourfully labelled diagram of a flower. 6. What is fertilisation? What happens after this process? Ans: Fertilisation is the fusion of the male and female reproductive cells. Formation of seeds and fruits takes place by the process of pollination and fertilisation.